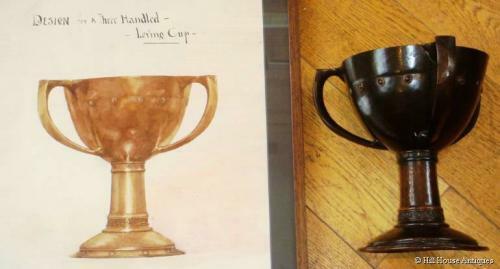 Rare Arts & Crafts survivor in the form of a medieval style, very well patinated bronze three handled tyg/loving cup with its original watercolour design, by Walter J Stockwin. Both pieces signed and the watercolour also has the "ESK" ( Examined South Kensington) embossed stamp. Walter Stockwin was a Birmingham School (born Aston, Warwickshire) metalwork/craftsman. He won a bronze medal for this design in 1903. Ref: Board of Education, South Kensington; National Competition 1903.